Like his predecessor, Pius VII endured imprisonment by Napoleon. He restored the Jesuit order in 1814. His secretary of state, Cardinal Consalvi, commissioned this monument by Thorvaldsen (the only Protestant sculptor in St. Peter's). A fanciful story developed that Thorvaldsen, being a protestant and not allowed to sign his work, carved his own face on Pius VII's body. A simple look at the portraits of each, prove this not to be the case. The funerary monument of Gregorio Luigi Barnaba Chiaramonti, born at Cesena (Forli) in 1742, pope from 1800 to 1823 with the name of Pius VIII, was made between 1823 and 1831 by the Danish sculptor Bertel Torvaldsen, from whom it was commissioned by Cardinal Ercole Consalvi. It is on the east wall of the Clementine Chapel, backing onto a large arch surmounting a doorway which gave access to the Chapel of the Choir but is no longer in use. The papal throne flanked by two angels, rests on the architrave; at the sides, on separate bases, are Divine Fortitude, wearing a lion's skin and with her arms gathered to her breast, and Wisdom, crowned with oak-leaves and with her eyes cast down. 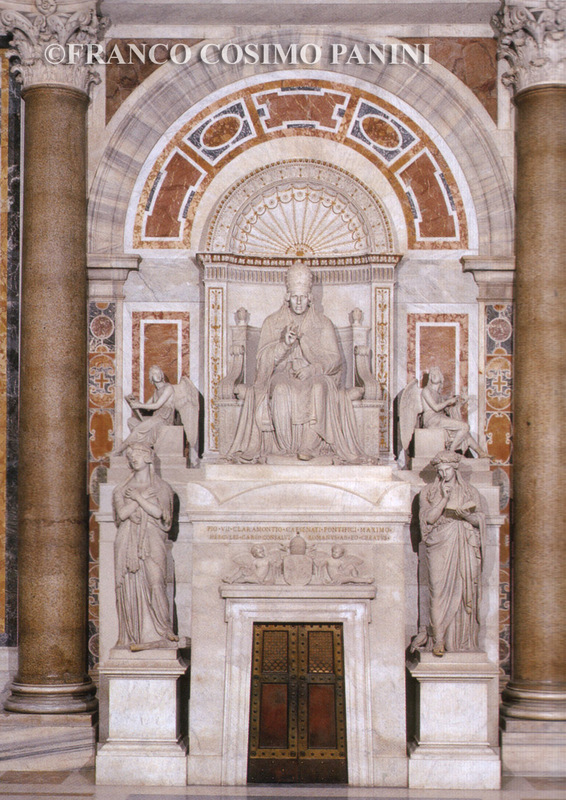 The Monument of Pius VII (1800-1823) occupies part of the left wall of the Clementine Chapel. 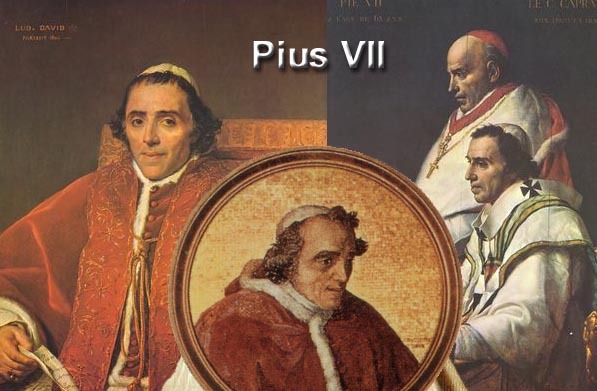 He was the Pope imprisoned by Napoleon and exiled to Fontainebleau. After his liberation, he did all he could for the emperor exiled at Sant' Elena and helped his elderly mother. The weary Pontiff is seated majestically on his throne and is blessing all, friends and enemies. 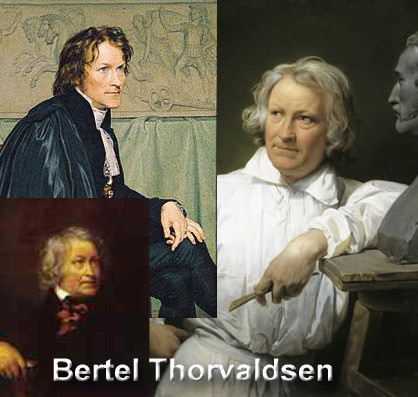 The monument is the work of the Danish sculptor, Bertel Thorvaldsen (1770-1844), Roman by adoption. Beside the Pontiff are two allegorical figures: the Genius of time and History, intent on recording the Pope's achievements with the hourglass and a book; on the pedestal are another two statues which represent Fortitude, with the lion skin, and Wisdom, with the book and the owl. 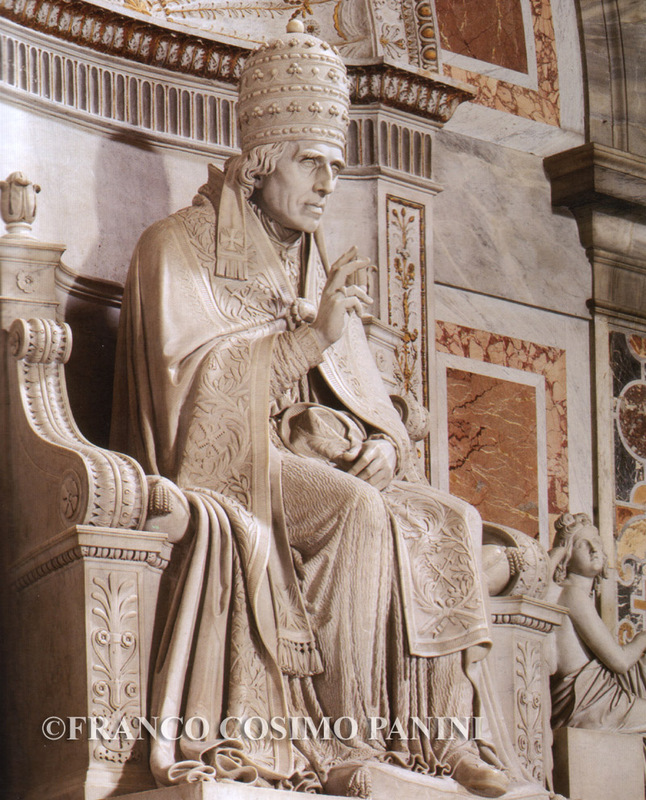 On the other side of the Chapel is the Monument to Pius VII by A. Thorvaldsen, the most valid of Canova's followers, who executed a work accurately described by Galasso Paluzzi as showing a "tiresome ostentatious overabundance." 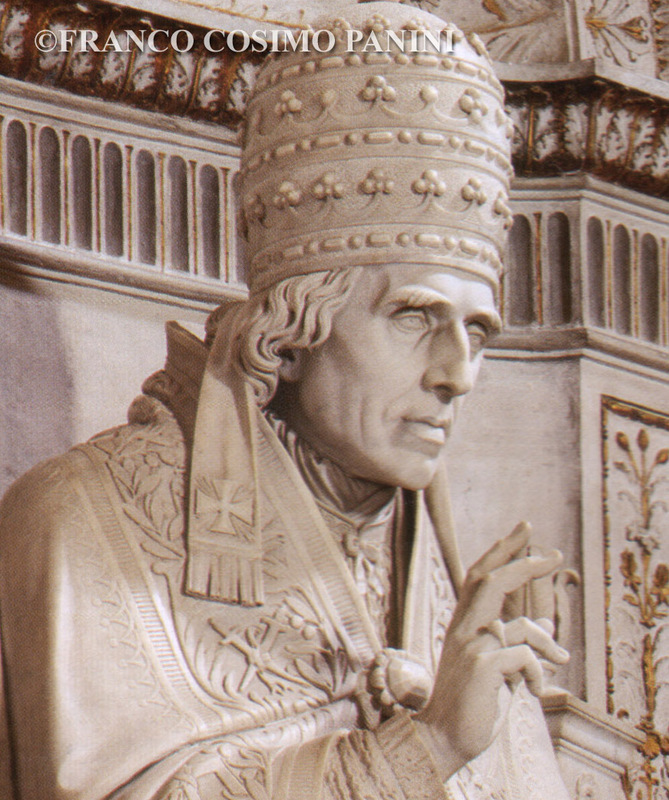 In fact, in his quest for simple stateliness and severity, there is little relationship between the sculptures - the emaciated Pope seated on a throne, the two winged spirits at his side and the excessively small statues of Time and History - and the naked, square base, somewhat out of character with the upper part decorated with rays. 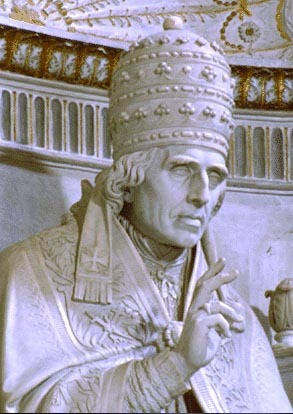 The monument to Pope Pius VII was created by Bertel Thorvaldsen. The work, balanced between a Canova-type inspiration and the subsequent naturalistic and neo-15th-century requirements, lacks compositional and interpretative emotional unity, since it is overly symmetrical and rhetorical. On the other hand, without the originality and sensitivity of Canova, it was difficult to match the neoclassical needs with sincere Christian acceptance about such a theme. In addition, the Danish artist is unable to create harmony between the whiteness of the central funereal temple and the surrounding statues, and the placid multicolored hues of the rear niche. The Pope seated at the See, in the act of blessing, appears too stiff in his solemn garments, almost as if he were posing for an official picture. 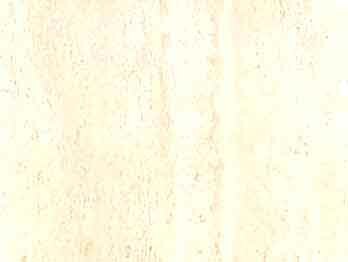 The expression of the face is more effective, and shows the signs of the exile and his long and troubled reign. Two winged cupids with more minute proportions, one symbolizing time (hourglass) and the other history (book), are located on the sides of the throne. The two statues of "Knowledge" and "Fortitude" are located on the sides of the Doric door, on high pedestals. The first is depicted in a meditative pose, with the Bible open, and at its feet, an owl, the symbol of prudence. The second figure is dressed in lion skins, while one foot stands on a club. On August 7, 1814, the feast of St. Ignatius of Loyola (now celebrated on July 31), in spite of protests from the Catholic powers, Pius VII restored the Society of Jesus. After falling and breaking his thigh some six weeks earlier, Pius VII died on August 20, 1823, two years after his nemesis, Napoleon Bonaparte, and was buried in St. Peter's. His longtime, faithful secretary of state, Cardinal Consalvi, sold all his precious objects and had a grand monument ... erected in Pius VII's memory.